The Philippine cuisine has a broad base. The Philippines has a great location where it is based with abundant natural food sources: seafood, fruits, vegetables and wild game. The sea is the principal source of food. 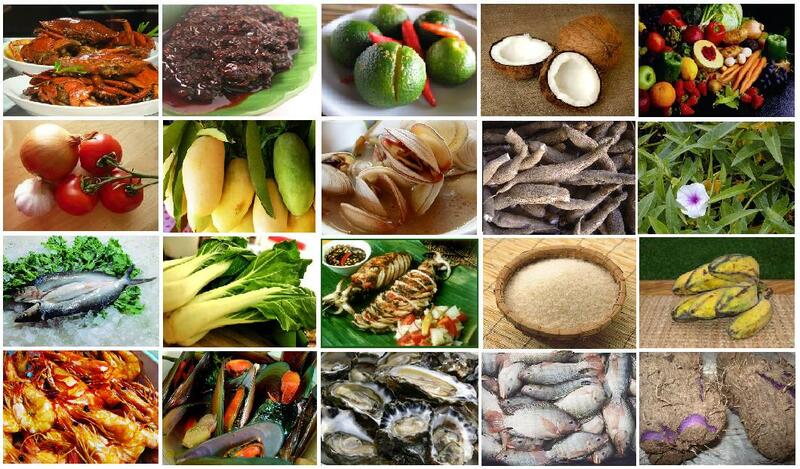 Hence, the Filipino diet is based on fish, crustaceans, and other seafood. Milkfish, tilapia, catfish, grouper (lapu-lapu,) mackerel (galunggong,) swordfish, game fish, sablefish, tuna, cod, blue marlin and squid are common ingredients in Filipino dishes. Popular shellfish include oysters (talaba,) mussels (tahong,) clams (halaan and tulya,) large and small crabs (alimango and alimasag respectively,) prawns (sugpo,) and shrimp. Dried and smoked fish are also popular. Also popular are seaweeds, abalone, and eel. The most common way of having fish is to have it salted, pan-fried or deep-fried, and then eaten as a simple meal with rice and vegetables. It may also be cooked in a sour broth of tomatoes or tamarind as in pangat, prepared with vegetables and a souring agent to make sinigang, simmered in vinegar and peppers to make paksiw, or roasted over hot charcoal or wood (inihaw). Other preparations include escabeche (sweet and sour) or relleno (deboned and stuffed). Fish can be preserved by being smoked (tinapa) or sun-dried (tuyo or daing). As with most Asian countries, the staple food in the Philippines is rice. It is most often steamed and served during meals. Leftover rice is often fried with garlic to make sinangag, which is usually served at breakfast together with fried egg and cured meat or sausages. Rice is often enjoyed with the sauce or broth from the main dishes. In some regions, rice is mixed with salt, condensed milk, cocoa, or coffee. Rice flour is used in making sweets, cakes and other pastries. Many Filipino cakes and delicacies use cassava flour or sweet rice flour. Sago or tapioca pearls and agar-agar (gelatin extracted from seaweed) are common ingredients for making desserts. A variety of fruits and vegetables are often used in cooking. Tropical fruits such as jackfruit, guava, star fruit, star apple, sweetsop, chico, bananas (the saba variety in particular), Calamondin (kalamansi,) mangoes, papaya, pomelo, and pineapples lend a distinctly tropical flair in many dishes, but mainstay green leafy vegetables like water spinach (kangkong,) Chinese cabbage (petsay,) Napa cabbage (petsay wombok,) cabbage (repolyo,) jute leaves (saluyot,) and other vegetables like eggplants (talong) winter melon (upo), okra, lima beans, bitter melon, squash, and yard-long beans (sitaw,) are commonly used. Abundant harvests of root crops like potatoes, carrots, taro (gabi), cassava (kamoteng kahoy), purple yam (ube), and sweet potato (kamote) make them readily available. The combination of tomatoes (kamatis), garlic (bawang), and onions (sibuyas) is found in many dishes. Ginger is also a common spice in many dishes. Meat staples include chicken, pork, beef, and fish. Seafood is popular as a result of the bodies of water surrounding the archipelago. The first meat in the Philippines was wild game: deer and wild boar. Later domesticated animals, such as the carabao (water buffalo), chicken, pig and goat made their way into the Filipino diet. Pork is popular in the Philippines while beef is the primary source of protein in Mindanao, where the Islamic influence reduce the consumption of pork. Food is often served with various dipping sauces. Fried food is often dipped in vinegar, soy sauce, juice squeezed from kalamansi (Philippine lime, calamondin, or calamansi,) or a combination of two or all. Patis (fish sauce) may be mixed with kalamansi as dipping sauce for most seafood. Fish sauce, fish paste (bagoong isda,) shrimp paste (bagoong alamang) and crushed ginger root (luya) are condiments that are often added to dishes during the cooking process or when served.